An evening at Jimmy’s #43 is normally pretty delightful. 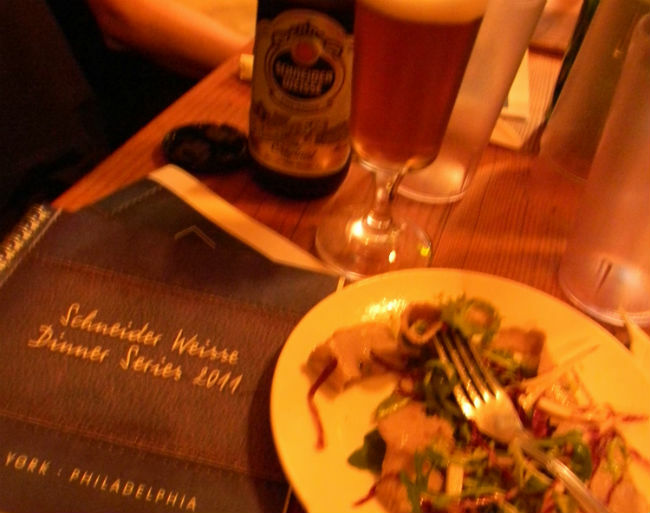 But last night I also had the opportunity to experience the Schneider Weisse dinner series. That’s four courses paired with four different Schneider Weisse brews. Host Susanna Hecht and Chef Josef Nagler graciously invited Jimmy’s clientele to taste a bit of Germany in the beer and food served. First course at Schneider Weisse dinner. The first course was originally supposed to be bull testicle carpaccio in Aventinus vinaigrette on arrugula salad. But there seems to be some difficulty getting bull testicle in New York City so that ingredient was replaced with a veal brisket. The dish was paired with Schneider Weisse Original, an amber hefeweizen. While the pairing was pretty tasty (the banana and clove flavors complemented this light dish well) I did have to wonder what it would have been like with a little bull testicle. Next, we were served a wheat beer soup with croutons paired with Georg Schneider’s Wiesen Edel-Weisse, a citrus-flavored wheat beer with a bit of spice. Susanna explained to us that this beer had been the brewery’s Oktoberfest submission when they were still located in Munich and able to participate in the fest. After World War II, when the Munich brewery was destroyed, operations were moved to Kelheim and the brewery was no longer able to be a part of the festival since Oktoberfest requires participating breweries be located within Munich. That being said, the well-hopped brew was certainly a worthy Oktoberfest submission. The soup was a creamy concoction with a vegetable stock base that paired well with the spiced hefeweizen. The third course combined pork tenderloin medallions in garlic cream sauce with wheat beer spaetzle and Schneider’s Aventinus. Again, Susanna provided a little brewery history: Aventinus, a dopplebock, was first produced when Mathilde Schneider, Georg III’s wife, took over the brewery after her husband’s death. It was unusual for a woman to run a brewery in those days so she caused quite a stir. When she named Aventinus, she chose the name of the street where the bottling line was located. But others insisted that she must name a beer after a Saint. So Mathilde did some digging and found a saint named Aventinus and so she was able to keep the name. And this dopplebock hints of banana and raisins and goes pretty well with meat dishes. I found the pork a bit dry but otherwise tasty. The spaetzle was heavy but delicious. Finally, we were treated to dessert: Eisbock parfait with carmalized apples and whipped cream paired with (what else?) Eisbock. The Schneider’s Eisbock is a concentration of Aventinus collected when the Aventinus is partially frozen. And, at 12% ABV, this sucker is really concentrated. It’s a beer to be sipped. The hints of banana and clove were much stronger in the parfait but paired well with the plum flavors of the beer. One note on the dessert, there was a touch of mint that didn’t really belong. It was a bit to intense for the dish but I was pretty happy otherwise. A final taste was given to us after dessert: A distilled Aventinus. This was a bit to strong for me but an interesting aperitif if you’re into that stuff. Schneider Weisse dinner series will continue for the rest of the week. Tonight, the hosts will bring their fine food and drink to Elsewhere in Midtown Manhatan then they go to Philadelphia, stopping at Brauhaus Schmitz on Thursday and Farmer’s Cabinet on Friday.